What is Off the Paved Road? Scroll down for the rest of the story. Click on thumbnail pictures for larger views. View of the Golden-filled mountain lake. It is one of the best feelings you will ever have when you can take some time from work and spend a few days with your kids and some friends in the mountains. It just so happened that this last summer my Friend Dalen and his son Dalton, along with Clancy and myself were able to take a three day weekend and head for the not so popular "Joe's Lake". 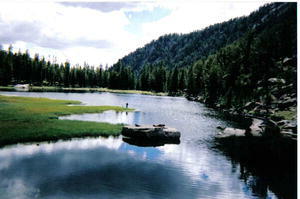 Many have heard of this small little mountain lake but I assure you that not many have ever been there. In fact I will go so far as to say that Dalton and Clancy are two of the youngest kids to conquer the side of that mountain and reach the summit. It all started a couple of years ago when I had read about a gentlemen heading into this little lake catching a few fish, which just so happen to be Golden Trout, and coming back out in the same day. The idea of catching Golden in one day seemed amazing to me since this magnificent trophy fish is only found in some of the highest and most remote alpine lakes. I had to give it a try and I was not going to pass up the opportunity without my son, which would turn the trip into 3 days instead of 1 but a remarkable accomplishment nonetheless. 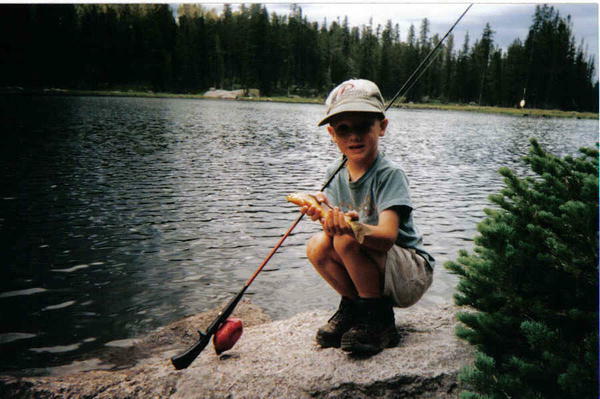 The youngest kids to fish Joe's Lake. An early start was a necessity since the summer heat is always an obstacle that I try to avoid. I figured it was going to take us about 5-7 hours to make it to the lake and that was if all went well. We left from the New Fork trailhead at first light and the little guys were setting a good pace. 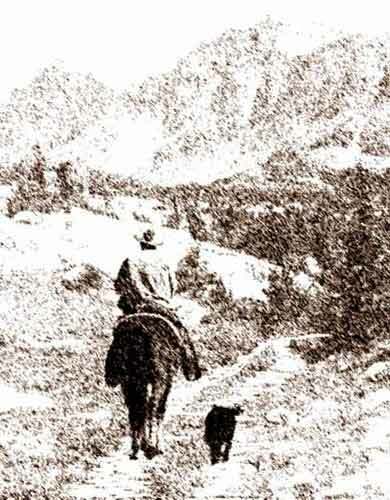 I could tell that the packs that Dalen and I were carrying would have fit a mule so much better but the misfortune of the whole deal was that our route was impassible by livestock. In fact it was very near impassible by humans but that remains to be told later on. By the time we made it to the head of the lake it was time for a little break and some revamping on my pack. 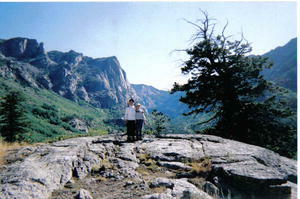 As we proceeded, the elevation gradually began to increase until the point we departed from the trail. It was then and there that the word "gradual" completely left our vocabulary and the phrase "bushwhacking" began to take on a new meaning. With the packs on our backs and the small aspens thicker than real estate agents in Pinedale, it was a challenge in itself just to maneuver through the trees. The fishing poles stuck a significant ways out the top of the packs, which were an additional challenge to manipulate through the aspens. We proceeded to the spot on the map where the contour lines get really close together. It was amazing to see the boys just keep scrambling up the slick rock and loose dirt. They seemed unaffected by the steepness for a while and were totally enthralled with the small snail shells they kept finding. Dalen and I, however, were finding other items such as oxygen and water more interesting along with keeping our balance on the steep slope a challenge in itself. About ¾ of the way to the top we found ourselves completely out of water and to my surprise had not crossed any small streams to replenish our supply. At this point we had no options but to put mind over matter and go for the top which was no easy task. The top was a welcome sight with the sound of a creek in the distance. It did not take long to drop the packs and head for the water. After some R and R we found the lake which was surprisingly small but surrounded by some steep cliffs and rugged rock slides making a beautiful backdrop. It was everything we had hoped for minus the escalator to get us there. A camping spot was picked out and the rods and reels were quickly assembled. Let the fun begin and let me tell you it really did. Within a few casts we were landing the vibrant orange Golden that I had only heard about. And the best part of the trip was that our 5 and 7 year old boys were a couple of the youngest kids to ever fish this lake and had the biggest grins you will ever see. Clancy: 5 years old and already outfishing his dad. The sky began to get dark and we were in for a wet night. We situated the camp with a tarp cover to protect as much as we could and settled in for the night. The next day was spent just FISHING. Two men and their boys in the mountains on a spectacular August day just fishing for the magnificent Golden trout and to top it all off we were doing quite well. Throw in some wild raspberries found in the midst of the rock slides and you have a memory of a lifetime. The evening meal was highlighted by a couple of these fantastic eating fish which were what you call "pan size" and a treat for anyone who has only eaten jerky, crackers and Kippersnacks for the past couple of days. Don't get me wrong, Kippersnacks are my food of choice on these mountain trips but there is just something about eating food that is fresh. When Sunday morning rolled around we broke camp and said goodbye to Joe's Lake. A different route to the bottom of the mountain was on our minds but we should not have fallen to the temptation. It started with some well used game trails that looked promising but shortly turned to cliffs and tall brush. There were a few moments that we weren't sure if the kids were going to stop or just keep rolling but somehow a tree or rock would break their fall before they had too much momentum built up. Dalen and I were stopping on a regular basis to give our knees a rest and were just as glad to find the trail at the bottom of the canyon as we were to find the creek full of water on our trip to the top. It wasn't long until we were on our final pull up out of the canyon and it was then that Clancy began to weaken for the first time. With a few short breaks and some words of encouragement from his friend Dalton we arrived at the trailhead greeted by the sight of four wheels and a motor. The Little Guide and his two pack horses. Please feel free to e-mail me or give me a call if you or anyone you know might be interested in opportunities here in Pinedale or just wanting to spend some time in the area. I am happy to make myself available to show you around our little town and probably even a little bit of off the paved road. Want information about Pinedale and area real estate? 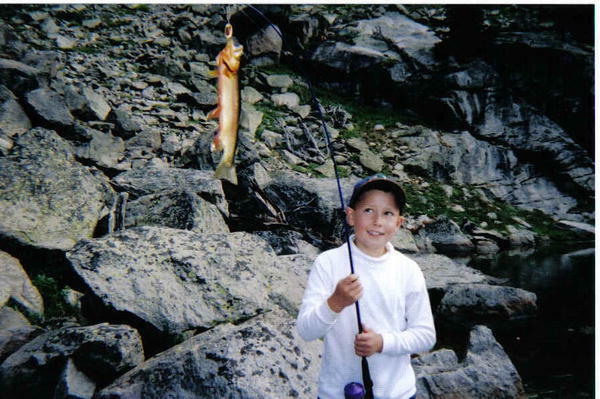 Want to know about hunting and fishing in Sublette County? 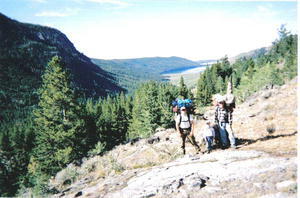 Off the Paved Road is sponsored and maintained by Pinedale Online, Pinedale, Wyoming. James can be reached by e-mail at:jrogers@wyoming.com or by phone at Pinedale Properties Inc, 307-367-6683. Click on small thumbnail pictures to see a larger version. Copyrights: Photos by James Rogers, 2004. Graphics by Pinedale Online, 2004. All content copyrighted by Pinedale Online. No part may be reproduced without permission.